MONTICELLO — First, Walmart conquered the Main Street market of hardware and underwear. Now the retail giant is going after another market — the Catskill kosher market of gefilte fish and blintzes. The Monticello Walmart just ran a full-page ad touting “expanded selections” in its “new kosher fresh section for the summer 2010.” It’s added kosher products like Empire organic chicken and Teva Angus beef sliders. And already in Sullivan County where the summer population triples with tens of thousands of Orthodox Jews, the push for the kosher buck is having an impact. A woman who was recently buying a whole organic kosher chicken for $3.68 a pound — in a case a few feet from the smoked pork hocks — said the Walmart in Monticello is convenient, the food is fresh and the prices are great. “We just want to have on hand what our customers want,” said Bill Wertz, a Walmart corporate spokesman. But unlike many non-kosher mom-and-pop shops that can’t compete with the corporation whose bankroll would make it the world’s 19th-richest country, the dozens of summer kosher shops in Sullivan say they’re ready to battle for their slice of the county’s million-dollar kosher market. 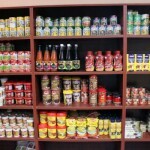 It’s a market that nationally is worth $200 million annually, although a Walmart spokesman wouldn’t reveal local sales. But delicacies like homemade gefilte fish — instead of Walmart’s frozen or bottled — fresh-cut beef flanken and fresh-baked kishka that are nowhere to be found in the Walmart kosher section with a Spanish sign above it. ”They find a super niche,“ he says. 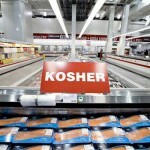 They also provide the personal service many kosher shoppers say Walmart lacks. Take Mountain Fruits supermarket in Monticello, which custom-grinds kosher beef and butchers that flanken in a shop that stocks everything from kosher Pez to kosher organic sesame breadsticks. ”They can try, but they don’t have the flavor for the ultra kosher customer,“ says owner L.D. Itzkowitz. Local shops like Mountain Fruits — and even longtime kosher food stocker ShopRite — also have loyal summer customers who appreciate the personal touch. But what if Walmart, with $405 billion in sales last year, does dent Sullivan’s summer business? 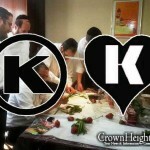 Kosher shop owners aren’t sweating — even in this heat. …and isnt Walmart owned by Jews!?!? !